A textbook is content created with Loudclass Author for Interactive class teaching and learning. Textbooks assigned by the teacher to the class are made available for download to the teacher and students assigned to the class. Tip : Textbooks are not shown in Interactive library and only downloadable when assigned to the class by the teacher. 2. Upload the textbook created with Author by selecting the “Browse” button. Important : Only ZIP format files can be uploaded and the file bigger than the maximum size cannot be uploaded. 3. Select the enabled “Upload” button after the file is uploaded. Textbook information can be entered after the file upload is complete. 4. Enter required fields (Category, Cover, Title, Author) and optional fields. 5. Check the information entered and save by pressing the “Save” button. 6. 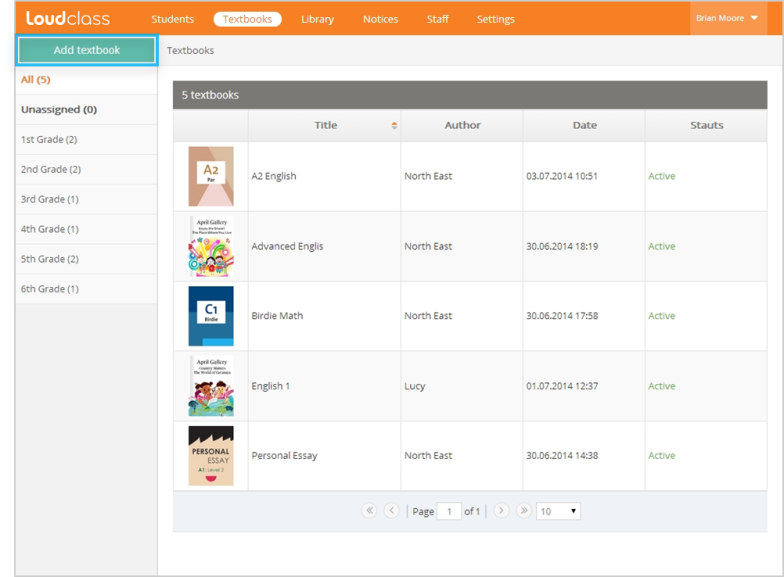 Saved textbooks can be checked in the “Textbooks” list of the assigned categories. 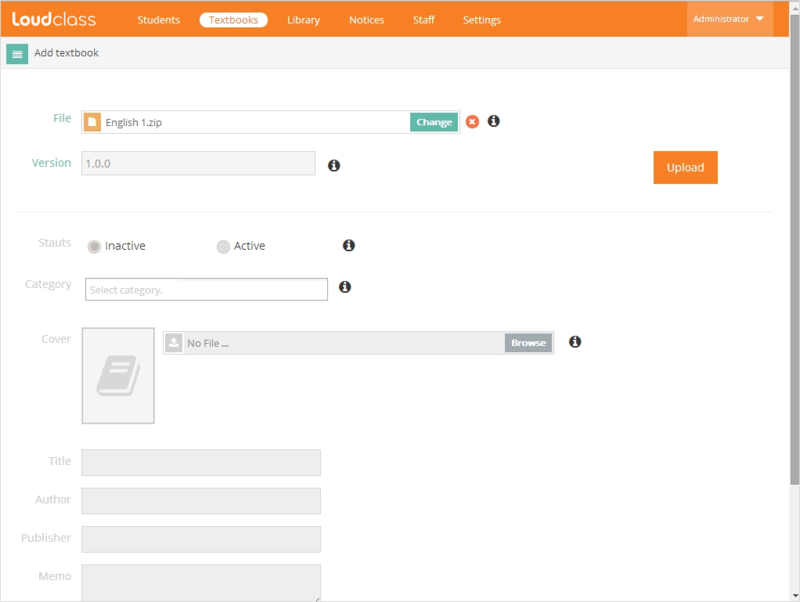 The Category helps with assigning textbooks in Interactive or managing textbooks in Cloud by presenting the textbook’s category name (as class name or subject name). A Category is not created when assigning textbooks but selected from the Category list created by the group management staff. The textbook has 2 status options and each status allows a different level of download. Inactive : The textbook is uploaded on Cloud by the textbook management staff but it is not downloadable. Active : The textbook can be assigned to a class and downloaded. Delete : All the textbook information is deleted from Cloud but books already downloaded are not deleted and can still be used. A download notice will no longer be provided. Tip : When a textbook is deleted, there will not be any notification sent to the teacher or students. Be sure not to delete the textbooks being used for the classes.